I am a third generation chair caner and seat weaver. I was taught by my father who learned from his father. 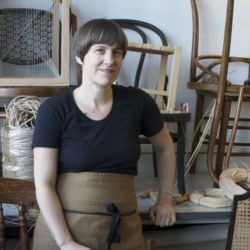 I now work in my studio in East London on fine antique and modern restoration and contemporary experimental seat weaving. I use traditional materials for chair caning, hand twisted rush seating, seagrass and Danish paper cord. I also make woven seats on new and restored frames from non traditional materials such as leather and wire. I have worked on commissions and collaborations with designers and larger companies and am a member of The Basket Makers Association. As well as commission work I teach classes in London.